Welcome to another week of the Love to Learn Linky! 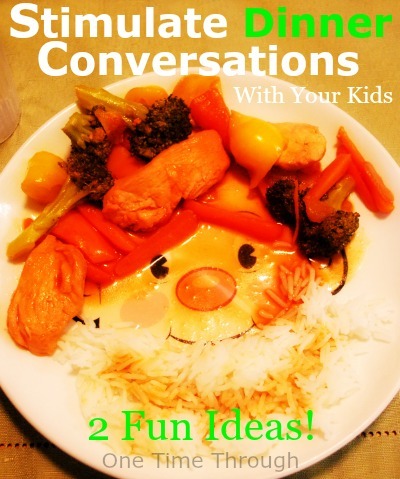 Our topic this week is about finding ways to stimulate conversation with kids at dinnertime. So – today I just picked my favourite post from last week’s linky to feature and added a few of my own ideas to it. Although today’s post is short, be sure to check out all the amazing links at the bottom from my fellow kid bloggers and I’ll see you back next week for my Hands-On Math post which was supposed to be today. Amazon Affiliate links have been included for your convenience. Please see Disclosure for more details. 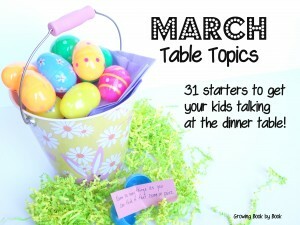 This week, I decided to feature Growing Book by Book’s recent post: March Table Topics – 31 Starters to Get Your Kids Talking at the Dinner Table. This is such an awesome idea! Basically, Jodie (an early childhood and elementary educator) created a list of printable topics to prompt kids to talk and THINK during dinnertime. Her starters include math, language and science concepts as well as just general information questions. I can see how kids would really love engaging in these conversations, and they’re a great way for families to bond and have fun together. Be sure to visit her site and print off your copy. I already have. Oh, and she does this every month – so you can visit her site regularly and have an entire year of conversations with your child or children – all for free! Jodie’s post totally reminds me of a book that I just purchased recently for a similar purpose. It’s called Q&A a Day for Kids: A Three-Year Journal and the idea is it provides a question to ask your child every day (with 3 years’ worth of questions) and a space where you can record your child’s answers for posterity! Q: Describe what one of your parents does for a job. The neat thing about this book is that each question is on its own page and there is room to record your child’s answer 3 times with the date. So you can look back and compare your child’s answers over the years as they grow. So much fun! Without the time (or money) anymore to scrapbook (being a single-income household), I really like having cost-effective ways to keep our memories – and the price of this book was doable for us. 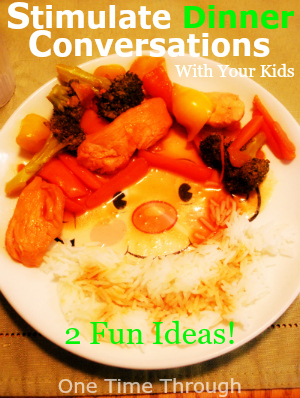 Those were our two ways to stimulate conversation with kids at dinnertime (or any meal!). Do you have any fun ideas to add? Leave a comment – I’d love to hear them. Visit One Time Through’s profile on Pinterest. And if you don’t want to miss out on any more of the fun we have here at One Time Through, sign up for our NEWSLETTER today. You’ll receive notifications by e-mail of new posts, our monthly newsletter jam-packed with fun, and you’ll also receive access to your exclusive FREE copy of all our newest printables! Find out more on our Subscribe Here page!